April Fool’s Day is one of my favorite online holidays. Unlike other holidays like Cyber Monday, where it’s all about sales, this one is specifically geared toward utter goofiness. Here is a round up of this year’s pranks. If you thought Amazon’s Alexa Echo was cool, wait till you see what she can do for your pets. Gone are the days of wondering what Rex’s barks mean. Lyft Mono: Real or Prank? Lyft really outdid themselves by creating the Mono, a fake (or not) wearable glove with a thumb that will hail you a Lyft car when you stick out your thumb. The problem with this prank is that Lyft went so far with it by having a pop-up event in San Francisco to show off the wearable and creating an app so that it ACTUALLY WORKS when you stick out your thumb at a street corner to hail a car. The reason Lyft went so big is because they actually have an executive prankster in residence. If you’ve ever had a delivery box stolen from your porch, you know how upset that can make you. Zappo’s solution is an invisible box. I am not sure this one should have been an April Fool’s prank at all. I enjoyed it immensely and hope it comes back as a regular Google Maps feature. Then again, I did end up wasting a good thirty minutes of my life playing it. Not a good idea when you are a hustling entrepreneur where every minute counts. Once I got the hang of it, I was mastering it like my 12-year old self once did the real Ms. Pac Man game. Booya! The Ms. PacMaps was such a hit that there were stories everywhere with guides for the Best Place to Play The Game. Google couldn’t just release one prank, so they graced us with the outdoor equivalent to Google Home. I would totally buy this, and I don’t think I’m the only one. Are you listening, Google? Wearables are seriously taking over, so why not a onesie, says T-Mobile. Hulu’s answer to our rapidly declining attention spans is their Hu service. It condenses all your favorite shows into 8 second clips so that you can play catch-up without having to watch the actual shows. I say brilliant and please make it a real service. Again, I’ll pay. One of my favorite pranks was from Snap, the parent company of Snapchat. Since Instagram pretty much ripped off their stories feature, Snapchat decided to make fun of them by creating an Instagram filter so that when you took a snap and looked for filters, it turned your image into an Instagram post. This one actually worked on me, so I would say it was the winner. I took a snap and then got confused thinking I did it in the wrong app. The funniest part of the prank was the comment from “my_mom and 2 others” basically implying that those were the only people using Instagram. It was a total burn and super funny. ThinkGeek comes out with some interesting prank products every 4/1. My favorite is the Swim Desk, because the standing desk is so 2016. I can’t say I wouldn’t consider purchasing this. There’s also the Westworld Full-Body Snake Temporary Tattoo, for those folks who want to feel prison-worthy bad-assed without really committing to it. It’s based on the HBO show Westworld. There were many other pranks like Elon Musk’s tweets about Chemtrails and Trulia’s pet listings, but they really didn’t delight me enough to warrant adding to my list. I would love to know which was your favorite prank and which you would actually like to see be a real thing. LOL I loved the one for pets and you are right. I would love to have a Google Gnome. So funny!! Those are great! I didn’t realize how much different companies were into April Fool’s Day. There are some seriously clever folks out there! Ha, these were all clever and funny but I liked Amazon’s Petlexa the best. I have and use Alexa and get some pretty weird responses sometimes so this prank is right on key. THese are some great April Fools Day pranks. I for one am not a big fan of the holiday. I have to say I kind of forgot about April Fool’s this year! That Google Gnome is pretty hilarious. These are great pranks. Snapchat doing Instagram is funny. Although I admit I laughed out loud when I saw the onesie. These are some pretty funny ones! I’m a little sad I missed the Google PacMaps though. That would have been awesome to play! OMG I love these! I especially could not stop laughing at Zappo’s invisible box – that cracked me up when I saw it for the first time! Get collection. These are all great Aprils Fool’s Tech Pranks. The ThinkGeek’s 4/1 Gags is my favorite because it reminds me of me trying to do too many things at the same time. These are hilarious! I can’t believe people actually fell for the LYFT one lol. These are all hilarious and it’s always nice seeing these companies prepare something entertaining for us. That snapchat filter is just so funny, what a way to throw some shade. I loved Google gnome! It was so cute, I still want to have it! Oh those google jokes are the best! is refreshing to find yourself in this pranks, like the pac man one! it is so funny! These April Fool’s tech pranks are so cool and fun to watch! Hahaha! Love this collection you made. I do want to say, the Swim Desk looks rather deadly. These are too funny! I have a married couple that are friends of mine that really out do one another each year. I ma amazed at what they do. There so many funny April fools prank videos that were going around. This is a great roudup of the ones I saw! It is worth noting that many different cultures have had days of foolishness around the start of April, give or take a couple of weeks. These are nice alternative to practical jokes that people usually do in person. I love April Fools but I don’t do pranks because I am afraid to hurt someone’s feeling. I always forget that it is April fools day until after it’s over. Nobody plays pranks on me, so I guess it makes sense why I forget. Some of these are so funny. I loved the one by the airline with the new planes with the flapping wings LOL. These are all fun! I’d like that invisible box. I always worry someone is going to steal my package! And I’ve always loved Think Geek! The Petlexa sounds like something I really need in my life! Maybe then my dog could tell me why he barks! This was a fun list of pranks!! I never knew companies went all out for April Fool’s Day. I would say T-Mobile and Lyft were my favorites since I watched both videos start to finish. Hulu was hilarious too though. But 8 seconds? I couldn’t do it. LOL! But I so love the commercial though. Needed this, thanks for the laughs. I like the post about Zappos and how to stop theft. I don’t know about an invisible box lol. I love the Google Pac Maps. It looks like a lot of fun if they really created it. Although I imagine it would be incredibly dangerous for people out there. I actually love the T-Mobil Onesie is something I would love to see real. Who wouldn’t want to be in comfort. Thanks for sharing all the pranks. I would have loved the pac map! I hope that Google brings that as a bonus feature for reaching your destination lol! It never gets old – I love watching prank videos. I could do it all day. I remember some of these and some I’ve just seen for the first time! Companies are really creative with their pranks and I always enjoyed watching them! Some of these are hilarious. I can’t believe some people really thought some of these were actually real. I love the anti-theft box from Zappos, haha! LOL these are so funny! I love the zappos prank especially since it takes in “chemicals” and a “rubix cube”!!! These are too funny! Petlexa had me cracking up and I found myself playing Pacman on Google Maps all day. 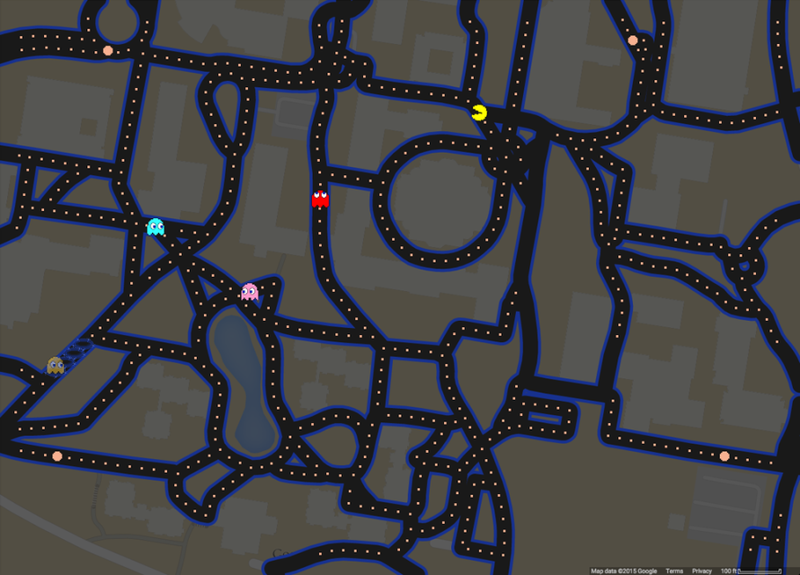 i loooooved pac man with google maps! Lmao.. even though I think the Zappos one is not that bad!! The pool.. sounds relaxing.. that prison tattoo 😬Lol. Haha love the swim desk! Not sure the whole electrocution aspect is a big selling point though – I loved the pac man thing too – didn’t realise it was an April fools and thought it should’ve stuck around! I love April Fools Day as well. We have fun pranking family members throughout the day. Videos was super funny as well. I used to love April fools day when I was growing up. Where I grew up it had to be before Noon however not all day. Some of your pranks are very funny.